A Silicon Valley startup wants to pair newfangled materials with silicon cells to create a higher-efficiency module. Perovskite solar has big potential. Can it ever catch up with low-cost Chinese PV panels? Silicon Valley-based Tandem PV closed a $2.4 million seed round in February to commercialize an exotic new solar technology. The startup is developing perovskite solar materials, which it will layer on top of conventional silicon cells to make a module that converts more of the sun’s energy into electricity. Perovskites hold the potential for cheap, flexible and efficient solar generation — if they can jump from the lab to the field. The initial cleantech investing boom pumped hundreds of millions of dollars into hardware companies that sought to improve on conventional silicon PV performance. In the end, the scale and price point of crystalline silicon drove most of the thin film, copper-indium-gallium-selenide (CIGS), and other technology alternatives out of business. It’s rare, then, to see investment flow back toward materials companies trying to take on the solar incumbent, especially given that perovskites have little experience outside the lab. “We can knock your socks off one square centimeter at a time,” said Tandem PV managing director Chris Eberspacher, referring to the thumbnail-sized test cells that perovskite researchers have had success with thus far. The seed funding will go to building a perovskite cell the size of a typical silicon cell, he said. From there, the company wants to scale up to a full-sized module within three years. The window of opportunity for venture-grade returns on solar hardware had passed, the thinking went, and trying to use fancy tech to compete with low-cost Chinese manufacturing was sheer folly. Tandem PV found support instead at Cyclotron Road, the tech-focused incubator housed at Lawrence Berkeley National Lab, and from there moved down to the heart of Silicon Valley to begin commercialization. Perovskites hold great promise for the solar industry because they can be designed with an unusually wide “optical bandgap,” which refers to the spectrum of wavelengths that the material can convert into electricity. Tandem PV takes its name from its tandem cell design. The plan is to stack the perovskites on top of silicon cells, which catch the wavelengths that make it through the perovskites. Tag-teaming the two materials will bump efficiency up from around 20 percent to around 30 percent, Eberspacher said. Tandem PV plans to print the perovskites as a thin film on the glass of the module, then stack it on top of the silicon cells. By using the same form factor, the company piggybacks on the existing installation techniques, but can pack more power into each module. “It drives down the cost of the overall installed system because it better amortizes the non-module costs,” Eberspacher said. Tandem PV doesn’t have many role models to look up to in the perovskite space, because nobody has made it to market yet. Perhaps furthest along is Oxford PV, which developed out of the university of that name and in 2016 acquired a thin-film factory in Germany to retool as a pilot line. Oxford’s approach is slightly different: It deposits perovskites on each silicon cell and puts them all together into a module, whereas Tandem PV plans to deposit across the entire glass panel. Polish company Saule Technology is developing flexible perovskites, another variant. Several other companies in the U.S. and elsewhere are honing their own take on perovskite solar. Crucially, Tandem PV’s strategy means it will never have to confront the incumbent manufacturers head-on. It can instead work with a manufacturer to laminate the perovskites on the glass, with minimal changes to the existing fabrication line. “We’ll be partners, not competitors,” Eberspacher said. Tandem PV funded its initial phase with grants from various government bodies, including ARPA-E. It also received an early investment from Incite Labs, created by Nest co-founder Matt Rogers. The seed round featured a global mix of investors, including Solar Group Indonesia, which runs a module assembly business serving Southeast Asia. New technology tends to start at a price premium before it scales; Tandem PV’s challenge will be to minimize that premium. Currently, it’s hard to say what price differential perovskites would have, because no comparable market-ready module exists. 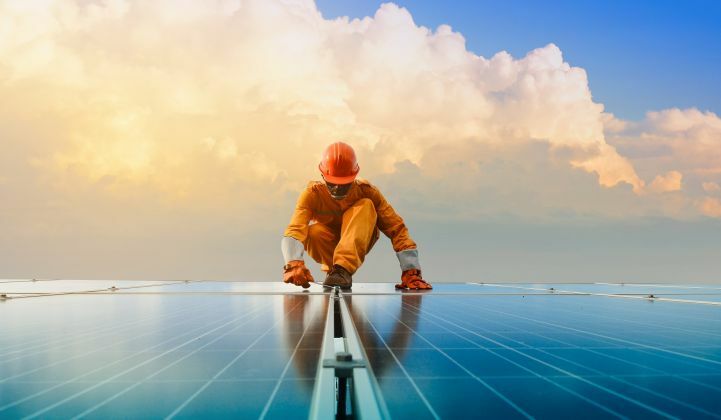 “The conversation is very new to even think about perovskites in terms of levelized cost of energy or dollars per watt compared to silicon,” said Xiaojing Sun, an analyst tracking upstream solar at Wood Mackenzie Power & Renewables. Space constraints have not been a major concern for installers, Sun noted, so the ability to pack more power into the same space won’t be a huge selling point on its own. As the solar industry has matured, though, customers are starting to shift their focus from upfront cost to lifetime costs, a trend that works in favor of high-efficiency products.